This Is Crazy By Babafemi Ojudu | Towncrier This Is Crazy By Babafemi Ojudu. Fayose has paid all transporters in Ekiti to hand over all their vehicles so that there won’t be any to bring the teeming supporters of our party from their various locations to receive Mr President. All the vehicles as I write this are parked in the premises of the Government House and local government secretariats across the state with the gates padlocked. He has shut all markets and asked people not to come out to receive Mr President. Alternative arrangements are being made to ensure we transport everyone of our supporters to Ado Ekiti to give Mr President a befitting welcome. This morning I feel like cursing every single person in our party and government who collaborated to truncate all efforts made by some of us to throw this guy out of our space before becoming a monster that he is today. I and my colleagues did everything legally possible at the inception of this administration to alert on the danger constituted by this fellow to our democracy and to our country. We moved and made arrangements to impeach him when our party had majority in the house. Our party members and a number of the leaders betrayed us. Even when he installed a new set of lawmakers ,most of whom knew not their right hand from their left , I investigated them and came up with concrete evidence to show that 14 of his 26 lawmakers forged their school certificates to secure eligibility. I have never , ever seen a situation where a governor has done this much to disrespect the President of his country no matter their political differences. At the heat of the disagreement between Governor TINUBU and President Obasanjo, Obasanjo paid a visit to Lagos State. Tinubu rolled out the red carpet and even sowed a uniform Aso Oke, for Obasanjo, himself and members of Obasanjo’s entourage with all the honors the President of the country deserved accorded him. This was at a time Obasanjo refused to make Local Government allocations available to Lagos for almost two years. From my vantage position I want to say and stand to be corrected that no single allocation meant for Ekiti has been denied Ekiti since Fayose embarked on his war against President Buhari. Every programs designed by the Federal Government to relief the people of hardship has been made available to Ekiti. In some cases it is the State Government that has been out of hostility refused to allow the citizenry to participate. A good example of this is the Home Grown Free School program that has so far benefitted majority of school pupils across the country. Fayose has serially abused the president , publicly wished him dead, libeled his wife and children , insulted him outside the country and the President has not only refused to respond to him but has ordered all of us who work for him and could give Fayose in equal measure not to engage him. 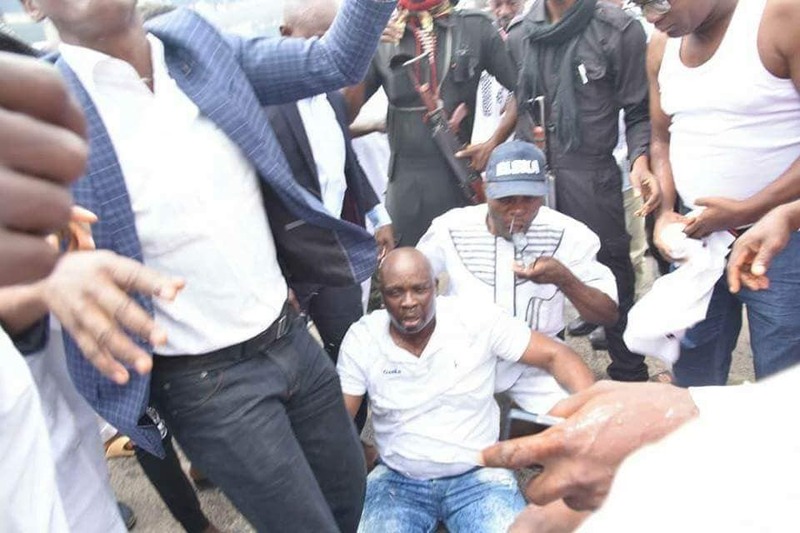 What Fayose has done very sad and inexcusable. We hope he won’t go ahead this morning and park trucks across the roads to block The President from having access to the venue of the rally. This fellow is capable of all that is indecent. Sadly last week a band of rogues went to my house in Ekiti under the cover of night ,the gained access to my house by removing the burglary proof , broke down all the doors and carted away all my property and that of my wife. This is the first time since I built the house in 2003 that I will experience this. The police till now have not been able to fish out those responsible. We shall not be deterred. We shall continue to work hard even at the risk of everything to bring sanity to our land.